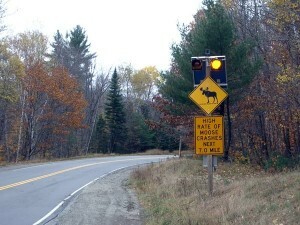 Is That Moose Crossing Sign For Real? Just a mile or so north of Brewster House on US-1, as you leave Freeport, Maine, there is a “Moose Crossing” sign. It fascinates many of our guests. One reason for the fascination is that most of the guests don’t see “Moose Crossing” signs (let alone moose) near their homes. Another reason might be that they’ve never seen a moose anywhere near the “Moose Crossing” sign. The conventional wisdom is that, if you want to spot a moose, you should go inland, to one of the areas in Maine known to have a fairly sizable moose population, then make sure to be there at either dawn or dusk, and you’ll be likely to see a moose, or maybe even more than one. We’ve tried that, and it certainly is a good way to go about finding a moose. One of our guests was determined that he was going to see a moose near the moose crossing sign, so he got up early and headed up US-1, and figured he’d go find a coffee shop open all night, then see if there was a moose near the sign. When he returned for breakfast, he told us he had seen a moose, off in the brush near the “Moose Crossing” sign. Since this fellow was known to exaggerate a bit, we were naturally a little dubious. We thought maybe he had seen a deer. Our skepticism increased when he came back the second morning saying he had seen a moose that day, too! But we realized he was giving us a true story when his tale was confirmed by another long-time guest that we trusted, who had gone out the same route for a drive, and had seen a moose in the same spot! So you can follow the conventional wisdom if you’d like to see a moose. Or you can come to Freeport, get up early, and hang out near the “Moose Crossing” sign. It seems to work!